Very into this main that can do both. We’d make this looker to serve at a special spring brunch (Easter-worthy, we’d say), or a mid-winter dinner party alike. You can get these ingredients any time, and they’re bright and tangy and earthy — fitting for any occasion. Maybe most importantly, it’s such a dead-easy recipe, we’d make it for a mid-week pick-me-up meal too. Preheat the oven to 300F degrees. Remove the fennel tips and reserve a few fennel fronds. Keep the stem of the fennel intact and slice the fennel in half lengthwise. Using a mandolin, carefully slice the fennel into ¼ inch slices. Toss the sliced fennel and olives in the olive oil, salt, pepper and crushed red pepper and arrange in a single layer on a baking sheet. Ensure the salmon is free of pin bones and lay it over the fennel and olives, skin side down. Drizzle with olive oil, sprinkle with salt and pepper and transfer the baking tray to the oven to roast for 18-20 minutes. While the salmon is roasting, peel 4 of the blood oranges as you normally would, taking care to remove as much pith as possible, then slice the blood oranges into ½ inch slices and set aside. Squeeze the juice from the fifth orange and whisk with the olive oil. 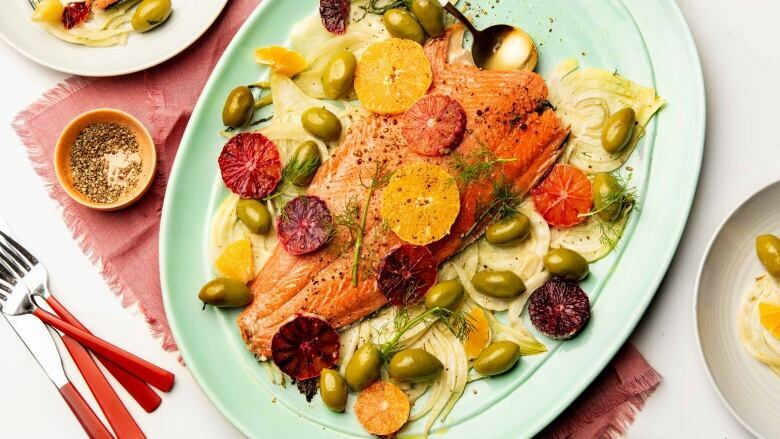 When salmon is finished roasting, transfer the fennel, olives and side of salmon carefully to a large serving platter. Drizzle orange and oil dressing over the salmon and arrange the sliced blood orange around the platter. Garnish with reserved fennel fronds, and salt and pepper to taste.